Yes, you read that right. This is the only Felony Form E36 sedan in the world. Prototype #001. Destined for SEMA 2016, the car never debuted due to a delay in parts, but now the build is unveiled once and for all in front of the iconic Seattle skyline. 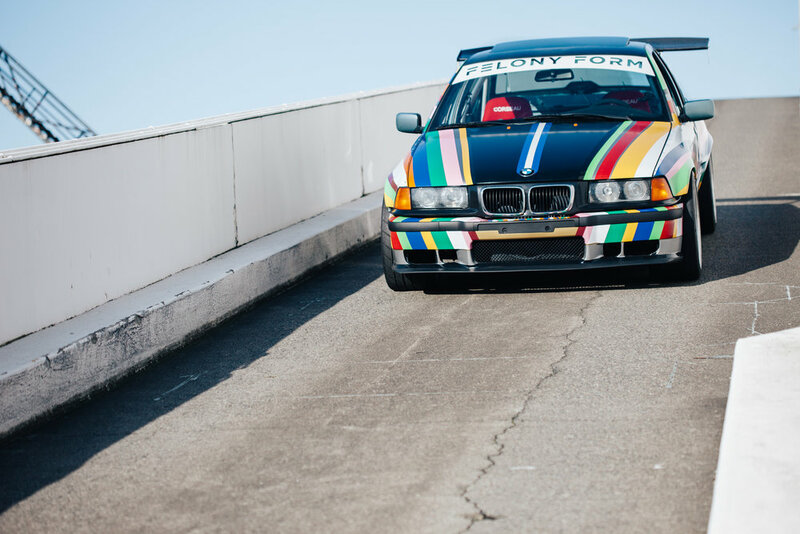 You may have heard of Felony Form from their widebody E36 coupes, but this car is their first foray into four-door territory. The one-off, handmade fenders are moulded into the rear doors for a seamless, factory look, whilst allowing for the fitment of super wide 18x10 wheels (Enkei NT-03 all around). 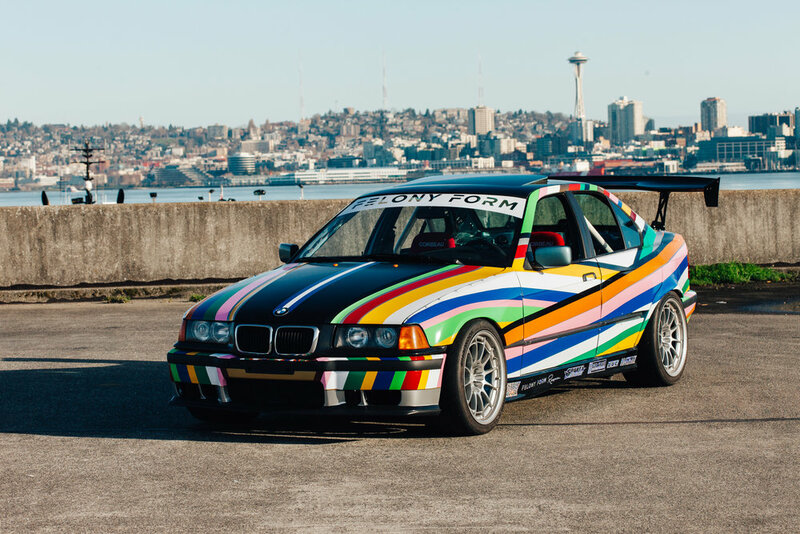 The eye-catching custom wrap was inspired by the 2010 Jeff Koons BMW E92 Art Car. Each stripe is an individual sticker, taking John Lee, the owner, nearly a month to complete the undertaking. Battle Aero's 70" Carbon GT wing provided the final touch for the DTM-style exterior. The car started off life as a 328is with the 2.8 liter M52 engine. Now the car sports S52 Cams, an M50 intake, SS Headers, a Z3 Oil Pickup Tube, and a Turner Motorsports Baffle Kit. These modifications coupled with the estimated 400lbs of stripped interior make the car noticeably quicker than stock. Other drivetrain upgrades include the 3.15 LSD from an E36 M3, UUC Motorwerks 8lb flywheel, and a BMW M5 clutch. UUC also provided track transmission mounts with cups and their Evo3 short shift kit with the DSSR (double shear selector rod). Anyone that has driven a car on the track knows that stopping power is more important than "go-fast" power. For that reason, Sparta Evolution provided their TS240X big brake kit, GP-1 rear rotors, and stainless steel brake lines throughout. Utilitarian and purpose-built, the interior has only the necessities. A smaller diameter Renown 100R Competition Suede Steering Wheel tightens the steering feel and the Corbeau fixed-back seats with OMP Camlock 5 point harnesses hold the driver firmly in place. The Under Pressure Racing roll cage stiffens the sedan up considerably, and with the lack of rear seat or carpeting, the car is still noticeably lighter than stock. Other touches include a custom made shift knob, door panel deletes, and a Works Engineering gauge set. Other suspension modifications include SPC Rear Camber Arms and front/rear trailing arm bushings from UUC Motorwerks. AST 5100 coilovers with camber plates and Nameless front/rear shock tower struts provide excellent road-holding abilities. If you look closely, the fenders bulge considerably (about 3 inches), yet they could be factory to the untrained eye. The whole basis of Felony Form's widebody is to be what BMW should have done - a smooth, subtle flare, designed around the lines of the body, but wider and more aggressive than stock. John Lee's build is one-of-a-kind and a great representation of the E36 platform's potential. 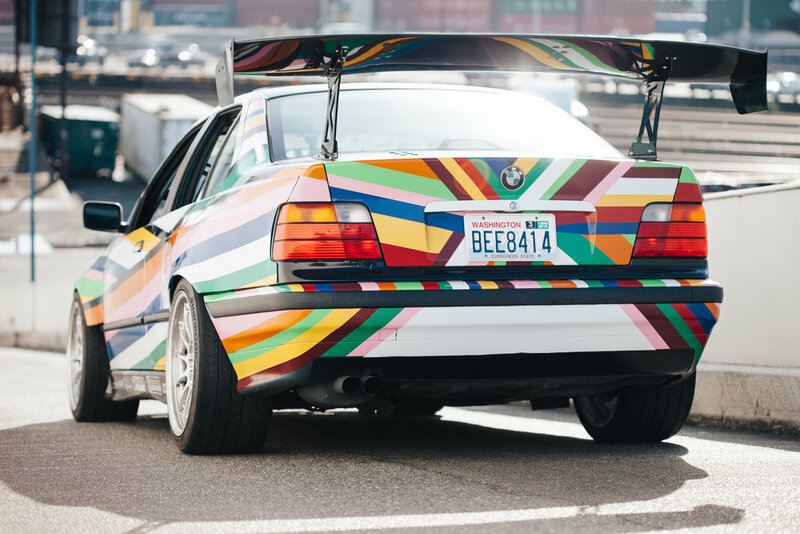 At a glance, the art-car wrap and carbon fiber wing let you know this is no normal BMW, but seasoned observers will catch the subtle, OEM+ widebody kit. While only a prototype currently, the Felony Form E36 fender flares are sure to be a hit when the final versions are released to the public.